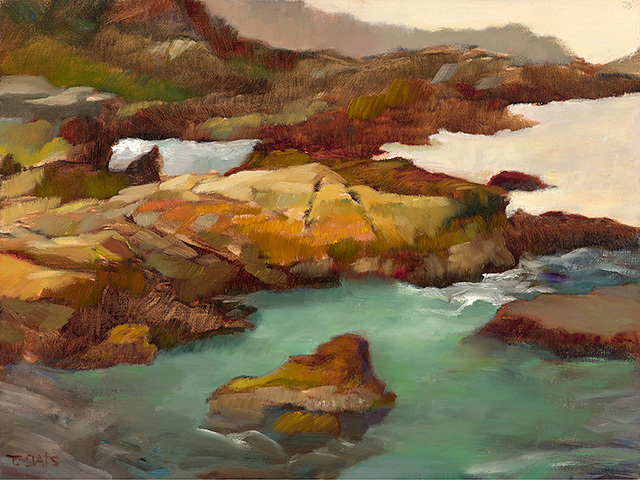 Humboldt State University Third Street Gallery presents "Two Views-Painting From Life," a two-person exhibition featuring representational paintings by husband and wife Jim McVicker and Theresa Oats, who reside on California’s North Coast. Together, this exhibition explores their long partnership animated by a mutual passion for painting the landscape, still life and portraits. The show runs from April 1 through May 14. Theresa Oats describes her hometown, Levittown, Long Island, New York, as “a cookie cutter, mass-produced suburb with wonderfully zany people”, most of whom were moving in from nearby, post-war New York City, bringing with them an artistic outlook and a great education system. Her father was in construction. He was very creative, illustrating in his free time as well as driving her family all over Long Island to explore its villages and towns. Her mother, a nurse, was fairly strict and not approving of art as a career. Yet, she still indulged Oats by buying her art supplies and eventually Oats went on to study art and design at the Fashion Institute of Technology in Manhattan. Theresa Oats first became aware of California’s North Coast at the age of 10. When visiting the American Museum of Natural History in New York City, she became separated from her group and found herself lost in the museum’s vast collections. She wandered into a room with a diorama depicting a Native American woman next to a river with giant trees surrounding her. The diorama, in fact, portrayed the redwood trees of California’s North Coast. Oats recalls that as she looked upon these giants in wonderment, she told herself that, “When I grow up, I’m going there.” When Oats, as an adult, decided to move west to Northern California, her intention was to find a place in the arts community of San Francisco. But she was persuaded by a friend to keep traveling 300 miles north to visit Humboldt County, California. Upon arrival, she was transfixed by the discovery that she had entered the realm of her childhood dream. She stayed. Since then, Oats has continued making art inspired by the North Coast’s landscape and the people who live there. Jim McVicker is a native of Ontario, California, which is about 35 miles east of Los Angeles. He grew up involved in sports but was constantly attracted to the arts and knew early on that becoming an artist was his path. After graduating from high school, McVicker traveled extensively in Europe and the United States. He recalls making his first plein air painting (painted outdoors) in 1973 while attending art classes at Chaffey Community College in Southern California. His influences then were the French Impressionists, primarily Monet, Pissarro and Sisley. By the summer of 1975 he decided to become a full-time painter. With $5,000 in his pocket, he quit his job, left school and moved to Northern California, eventually settling down in Humboldt County. McVicker and Oats met in Humboldt County and were drawn to each other by their love of the landscape and their shared approach to painting. Both artists make their work from the direct observation of their subjects, eschewing the use of photographs as an aid in their process. 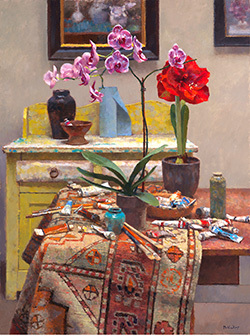 When not painting outdoors, they are working on still life, figure painting and portraits in their large, sunny studio. Married since 1988, they continue to make their home and studio on California’s North Coast, surrounded by the magnificent landscape that brought them together. “Jim McVicker and Theresa Oats: Two Views-Painting from Life” is produced by Humboldt State University students. Students enrolled in the Art Museum and Gallery Practices Program participate in the daily management and planning of shows at the gallery. The gallery provides real-life opportunities for the students to develop their gallery and museum skills, which in turn provides them with experience that will help them to enter the job market. Many students who have participated in the program have gone on to careers in museums and galleries throughout the nation.